Prelude: To me Punch is one of the most criminally underused characters in Transformers history. He is a spy working undercover among the Decepticons, using a secondary robot mode (that may or may not be developing its own personality) to remain undiscovered. The story potential here is enormous, but the closest we’ve ever come to see it realized was with Animated Shockwave. But hey, now that Punch and his undercover ID Counterpunch have a new toy in Power of the Primes, maybe we will finally see him appear in a non-Japanese-exclusive story one day. Here’s hoping! Quick-Fix: Before we go into the actual figure, you should be aware that Punch comes misassembled. The two shoulder pieces, where the arms connect to the torso, are switched, which makes it rather hard (though not impossible) to properly align Punch’s arms in car mode. It’s an easy fix, though, and you don’t even need any tools. Just remove the arms, pull the chest slightly apart, and switch out the shoulder pieces, done. Robot Mode: Let us start with Punch’s “true” robot mode, a robot with an orange torso, blue limbs, and red hands. Here Punch looks the quintessential Autobot, complete with a very Optimus-Prime-like head and face. The robot is very nicely articulated and the detailing looks pretty good, too. Also, you can look at Punch from the back without immediately noticing that there is another robot mode hidden there. The black helmet Punch wears obscures that he has another face on the back of his head quite nicely. Punch comes with an orange gun and the obligatory chest armor / combiner fist that all Power of the Prime deluxe figures have. It’s a little strange, given that Punch cannot become a combiner limb, but he can still wear the chest armor. He shouldn’t, though, it looks dumb. Anyway, Punch is a very nice looking robot. Barely any car kibble, very lean-looking, and just plain fun. Nothing to complain about. In order to assume his secondary robot mode as Counterpunch, you basically turn Punch around. His Autobot insignia is covered, the Decepticon insignia is uncovered. The shoulder pieces are folded out sideways, the helmet is tipped back, and the red hands are flipped for black ones. Done! Now you have Counterpunch, who is looking every inch the Decepticon in blue and black. Just as well-articulated as Punch, just as nicely detailed as Punch, but looking very much different. The hand-switching gimmick is a nice idea, but sadly he wields the same orange gun as Punch. Would have been better to go with two different weapons here like G1 Punch/Counterpunch did. Apart from that, though, very nice. A perfect secondary robot mode. Alternate Mode: Punch transforms into a generic blue sports car with red wheels. A large portion of the chassis actually emerges from the robot’s legs, which is pretty impressive engineering. Not quite Prime Vehicon levels, but good. The resulting car looks pretty nice, too, and there is no hint of a robot mode to be seen. Okay, he’s got visible head syndrome on the car’s underside, but as we have learned from the Bumblebee movie trailers, that is canon. Punch’s gun can be stored on the underside, too (and even hides the head a bit) and if you really want, you can mount the gun and/or the combiner fist chest armor on top of the car, too. So all in all, a pretty nice car mode. A bit boring when compared to having two robot modes, but good. 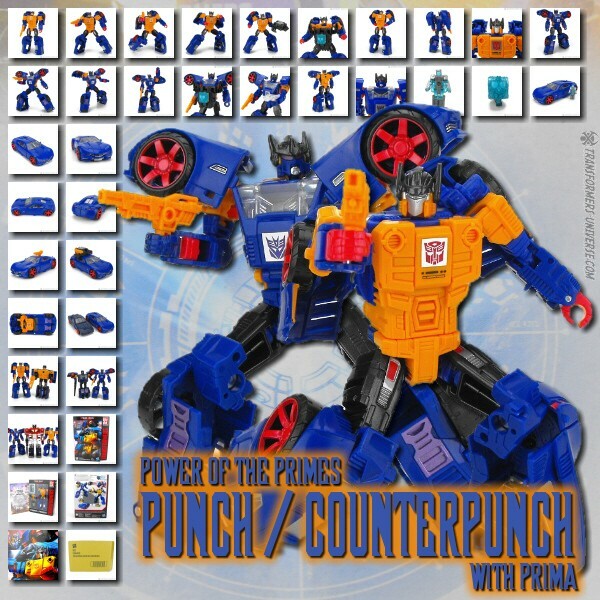 Partners: Punch / Counterpunch comes with Prima, a translucent version of the Prime Master we’ve already seen in the Throne of the Primes set. So if you want Prima but don’t want to buy the entire big set, you can get him with Punch, too. Of course that still means you’re missing three Prime Masters who came exclusively with that set. Anyway, Prima can be put into the chest armor for Punch or Counterpunch to wear. That’s pretty much it. Remarks: Punch and his Decepticon counterpart had but a very brief showing in the finale of the original Transformers series. He starred more extensively in the Japanese Headmaster series, but served as little more than a convenient way for the Cybertrons to be kept apprised of the Destrons’ movements. That’s pretty much it apart from a few small comic cameos. We’re still waiting for the definitive Punch / Counterpunch story, something not even IDW attempted in their lengthy run. Sadly it seems we need to wait on. Punch / Counterpunch is the third Amazon exclusive connected to the Prime Wars series, preceded by Blast-Off (Combiner Wars) and Repugnus (Titans Return). I ordered him almost the moment he was available on the Amazon website and do not regret it. He is a very good figure, far superior to the previous incarnation of the character, Timelines Punch, and just a good Transformers toy overall. He very nicely implements the double spy gimmick, has no flaws, and apart from being misassembled out of the box there is nothing to complain about here. Fully recommended.